Corey Mwamba (vibes); Laura Cole (piano); Andy Champion (double bass); Johnny Hunter (drums). Corey Mwamba has been a frequent visitor to Tyneside playing with a variety of bands. 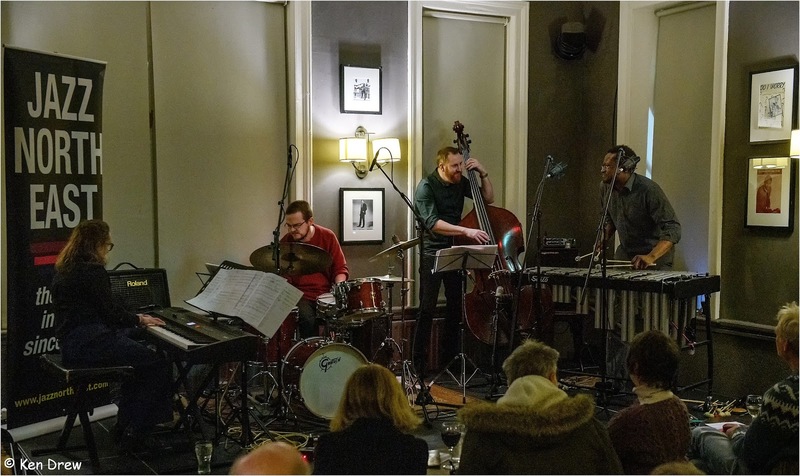 This nth quarter is a newly formed ensemble featuring some of my favourite players Laura Cole on piano, honorary Geordie Johnny Hunter on drums and full time 100% Geordie Andy Champion on double bass. Corey Mwamba is not just a fine technician on vibes but also a very entertaining performer who always seems to establish a great rapport with his audience. However, he took a decision several years ago to hang up his mallets as far as live performances are concerned. So Sunday night’s gig with the nth quartet was the last time that we get to see him perform live (he will still be making music and sharing it digitally in his studio). Corey explained at the start of the gig that as his retirement gets closer and closer he gets happier and happier so this gig was a celebration rather than a sad farewell. The first set was very structured and intense it was probably the tightest and least improvised of any Mwamba gig I had seen. Not to say it was all melody and saccharine a number based on Giant Steps emphasised the creativity of the quartet. The second set was far livelier as opposed to the first which, if I dare to say, was a touch melancholic. By contrast, this set was full of life and exuberance with great empathy and commitment from all involved. A fitting finale to a great live career and the packed audience gave the band a rousing ovation at the gig's conclusion. I for one will certainly miss Corey’s departure from the live jazz scene but I can only wish him every success and happiness in whatever direction his future career takes him.